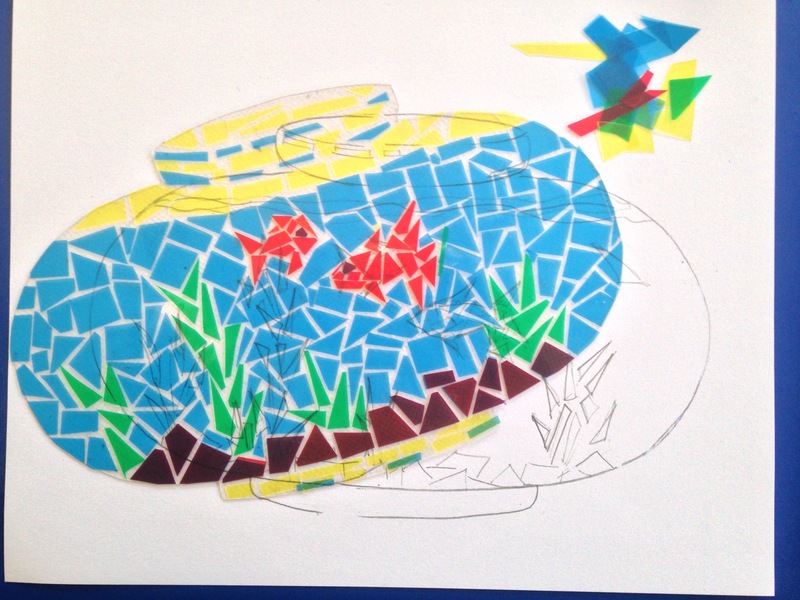 Project Description: DIY mosaic fish bowl made with Grafix Colored Clear-Lay and Artist-tac. 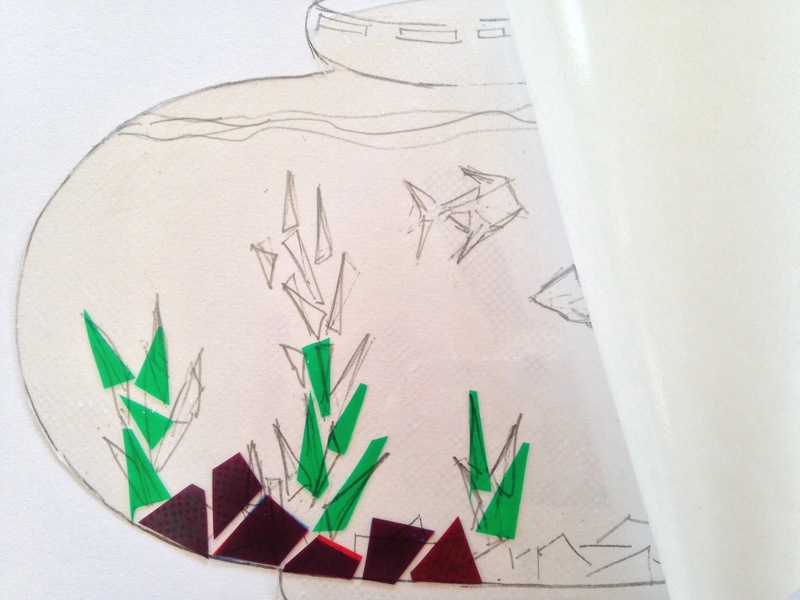 Create a sketch of the exterior and interior layout of the fish bowl. Include elements such as plant life, rocks and of course the fish themselves. Younger grades can keep these elements simple but older grades can get more advanced in the number of elements they include. Make notes on the drawing as to what color of Clear-Lay will be used for which objects. Keep in mind students can layer colors on top of each other to vary their color palette or create darker colors. 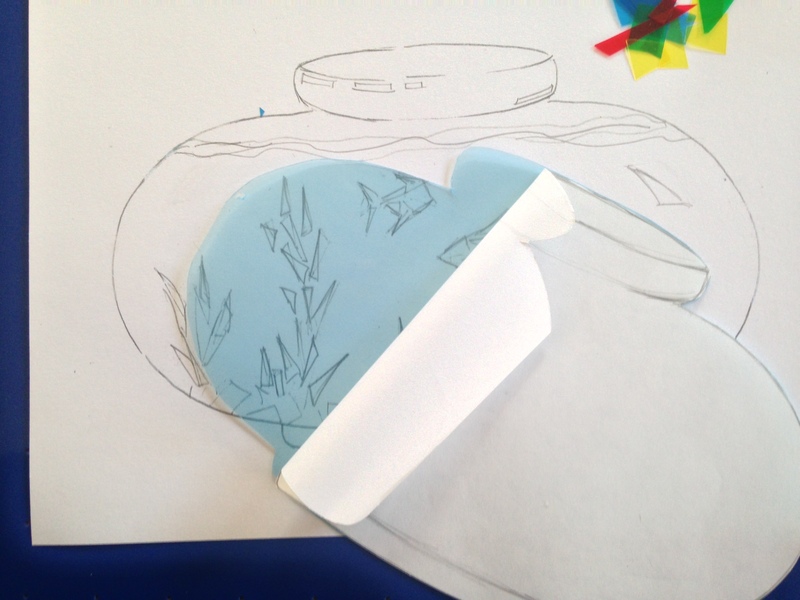 Cut bowl shape out of drawing and then trace and cut Grafix Plastic Craft Sheet to the shape of the bowl using scissors. Precut “mosaic” tile shapes from the Colored Clear-Lay Sheets. Cut approximate quantity needed of each color for the project. Artist-tac is a dot transfer adhesive. Peel off one liner (mark the back with an x and save as a protective sheet for later if students don’t finish within the class) and apply the Grafix Craft Plastic to the sticky side of the Artist-tac. Remove the Craft Plastic from the Artist-tac, set aside, sticky side up over your drawing so you can see the drawing under your Grafix Craft Plastic. You can reapply the first liner to the fish bowl and protect the adhesive surface of the Artist-tac while the artwork is in storage. The x allows you to remember which side is clean. Apply Colored Clear-Lay mosaics to your design, leaving a small space between each tile creating a mosaic affect. Try not to touch the Artist-tac unnecessarily, in order to retain its adhesive quality. To change the color of a tile, simply layer tiles on top of each other using the Artist-tac on the back. If you make a mistake, reposition carefully or slide over to another spot. Tiles can only be moved once. After that, reapply Artist-tac to a new tile and add. 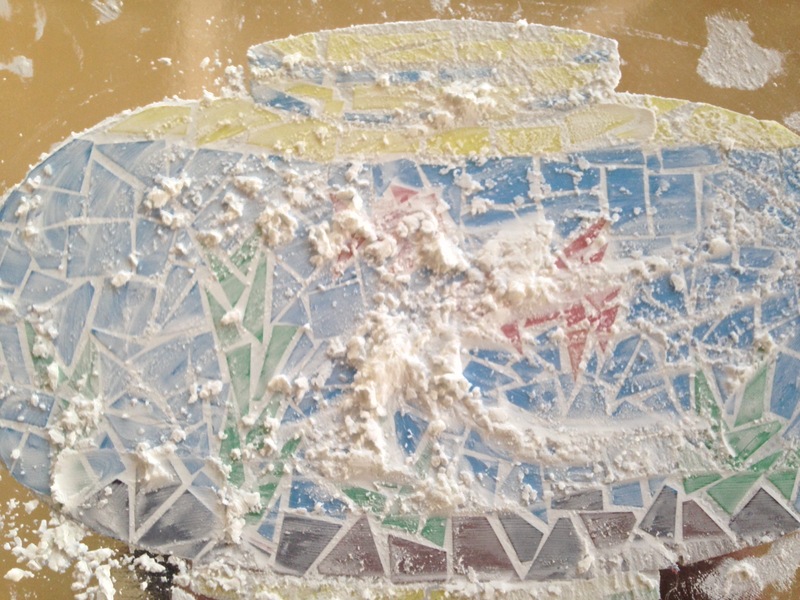 When the entire surface is covered with Colored Clear-Lay mosaics, dust the surface with cornstarch or baby powder. This will go in the cracks between your Colored Clear-Lay mosaics and will adhere to the sticky dots to act as a grout. Use a soft cloth (old t-shirt works best) to build up the shine of your mosaic and buff off any adhesive residue that may be on the tiles. Several applications of the powder may be helpful to build up the “grout” appearance. 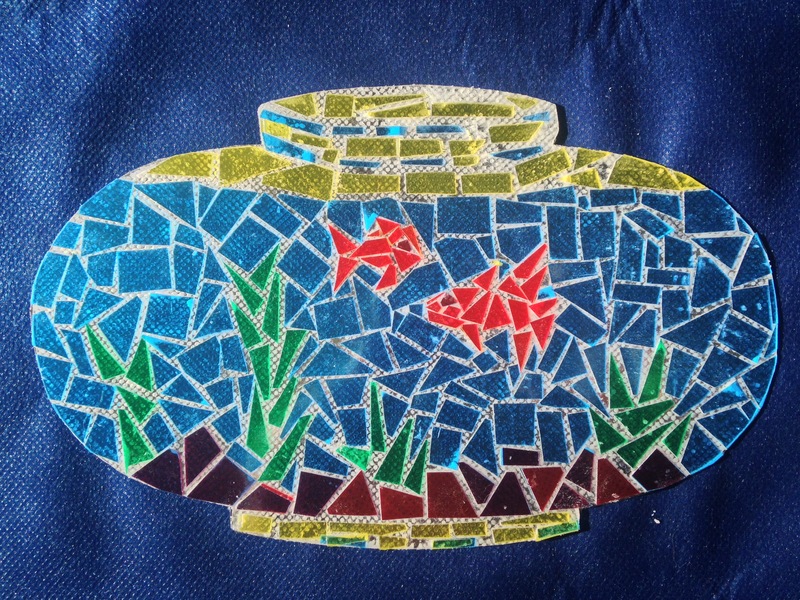 Give a glass-like appearance and enhance tile colors by applying a layer of Artist-tac to the backside of the fish bowl and mounting the piece onto a sheet of Metallic Foil Board. Cut to the shape of the bowl. For a more translucent appearance, omit this step.